Perfectly illuminate your waterfall or part of your yard using the Savio Radiance Halogen Light with Transformer. Adding a light to your water feature brings an inspiring look to it, allowing you to enjoy it throughout the evening. The 50 Watt halogen bulb emits a soft, white light, and its 20' long cord allows you to place it virtually anywhere in your water. The black, waterproof casing and tempered glass lens ensure a fully submersible light, while also allowing the unit to be used in your landscaping. An adjustable base enables you to angle the light upward or downward as desired, and a set screw locks it into place. The flat base can mount to a wall using screws (not included), or to a flat surface in your water feature for stability. Attach the two-pronged cord to the included transformer, to power it safely. 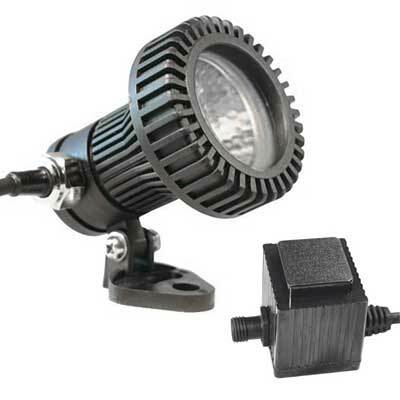 Highlight your waterfall or a group of plants using this Radiance Halogen Light with Transformer. One year limited warranty on light.